After helping General Manager John Laurinaitis get a win over John Cena at Over the Limit, the Big Show appears to be firmly in the pocket of the man who fired him two weeks ago. 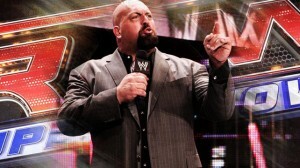 A turn as a villainous giant might be a good direction for both the Big Show and Raw. On this Memorial Day, everyone at MLD thanks those who’ve given their lives in service to the United States throughout its history. As we take a day to ourselves, this abbreviated edition of the Warm Up comes on the heels of a less than memorable edition of Raw last week following the Over the Limit pay-per-view. Hopefully, tonight’s show in New Orleans does more to distinguish itself in the weeks leading up to No Way Out. Last night at the Over the Limit pay-per-view, WWE Champion C.M. Punk defended his title against Daniel Bryan. The controversial finish promises that we'll see more tension between two of the best on the roster tonight on Raw. Monday Night Raw rolls into Richmond, Virginia tonight on the heels of last night’s Over the Limit pay-per-view and a lot of build up from last Monday. Friday’s edition of Smackdown also drove forward the rivalries between C.M. Punk and Daniel Bryan for the WWE Championship as well as a burgeoning feud between Sheamus and Randy Orton for the World Championship. Both of those titles along with the Tag Team and Divas Championships were successfully defended last night, but we’re sure to see more from the principals involved tonight. It’s also a safe bet that we’ll see more of new Intercontinental Champion Christian and former champ Cody Rhodes. 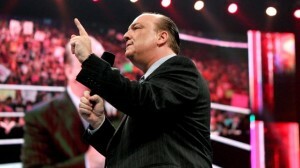 Paul Heyman made a surprise return to Monday Night Raw last week as Brock Lesnar's official representative. Even though Lesnar stated he is "finished" with WWE, expect Heyman to continue appearing in his absence. Tonight’s Raw from Pittsburgh, Pennsylvania, is WWE’s final live effort to sell Sunday’s Over the Limit pay-per-view. With only three weeks separating events on the PPV schedule right now, it’s difficult to generate momentum particularly when the last offering, Extreme Rules, was primarily WrestleMania rematches. Last Monday didn’t do as much as we’d have liked to feature the marquee match for Over the Limit, Daniel Bryan versus C.M. Punk for the WWE Championship. It did, however, go a long way to establish the World Championship picture for the upcoming show. There’s a lot of ground to cover tonight, and hopefully everyone will get their due airtime including another appearance by Paul Heyman as Brock Lesnar’s representative. There went the pain? After a viciously assaulting WWE COO Triple H last Monday, Brock Lesnar's return to wrestling seems to be at an end. Expecting him to disappear for a few weeks before another monster return. It’s fair to say last Monday’s Raw coming out of the annual Extreme Rules pay-per-view wasn’t the best we’ve ever seen, but it was by no means the worst. The whole show was structured around a Beat the Clock Challenge to determine the number one contender for C.M. Punk’s WWE Championship at Over the Limit on May 20th. While the execution has been better, The Beat the Clock gimmick is solid and the outcome can only be captured in one word: YES! Tonight’s show in Greensboro, North Carolina will hopefully give us more of Daniel Bryan’s quest to take the WWE Championship from Punk, and less of all the things we found ourselves saying “NO!” to.